This tutorial has tips and tricks on how to debug Crystal projects. 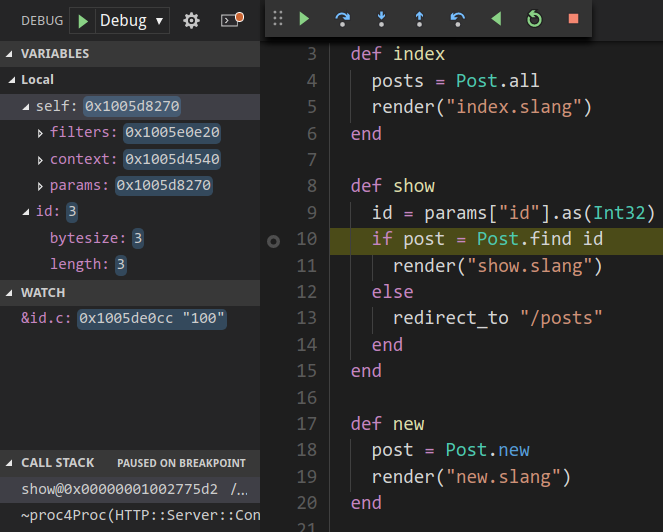 It shows how to leverage tools like GDB or LLDB using debugger clients like Native Debug for VSCode. Install gdb or lldb accordingly to your OS. Confirm that the above prerequisites are installed before setting up the debugger. These settings have been verified for a MacOS and Linux's environments. Fully debugging Crystal applications is not supported yet. You can use some of the techniques below to improve the debugging experience. Instead of putting breakpoints using commands inside GDB or LLDB you can try to set a breakpoint using debugger keyword. Currently, Crystal lacks support for debugging inside of blocks. If you put a breakpoint inside a block, it will be ignored. As a workaround, use pp to pretty print objects inside of blocks. Sometimes crystal will optimize argument data, so the debugger will show <optimized output> instead of the arguments. To avoid this behavior use the @[NoInline] attribute before your function implementation. Then use print in the debugging console. $1 = (UInt8 *) 0x10008e6c4 "Hello World!" $19 = (UInt8 *) 0x10008e7f4 "item 0"
Change the buffer index for each item you want to print. You can use self.foo in the debugger terminal or VSCode GUI. This trick allows showing the bar_hello_to_s variable inside the debugger tool.